Happy Monday! Or maybe I should just say - we meet again, Monday. LOL I had so much energy the last half of the week and then this past Saturday hit and I ran out of steam. I tried to do some things early in the day, but tuckered out in the afternoon and stayed in bed until late Sunday morning. Ugh. The temperatures have begun to drop a bit on some of the days and it feels wonderful. 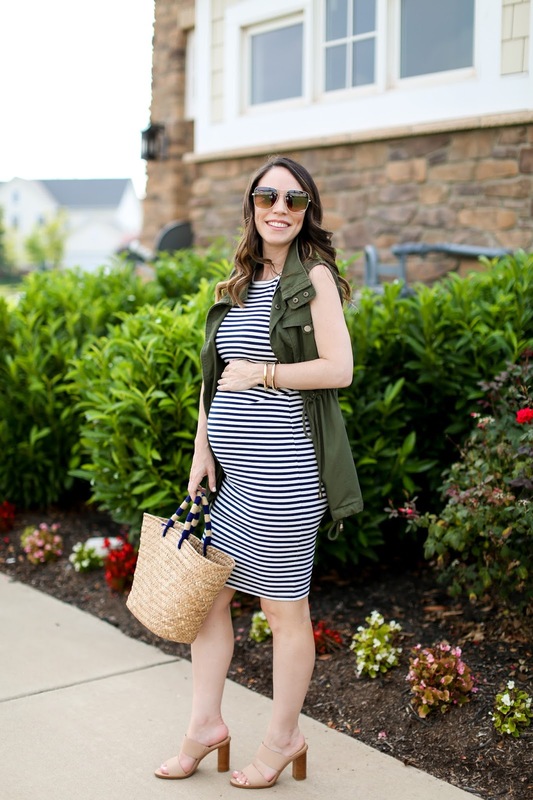 The heat surprisingly didn't bother me much this summer, even while pregnant, but I do enjoy spending time outside and 90's with humidity does not make it fun. I'm not in full-on fall mode, but it's beginning to grow on me especially with regards to a few of my outfit choices. 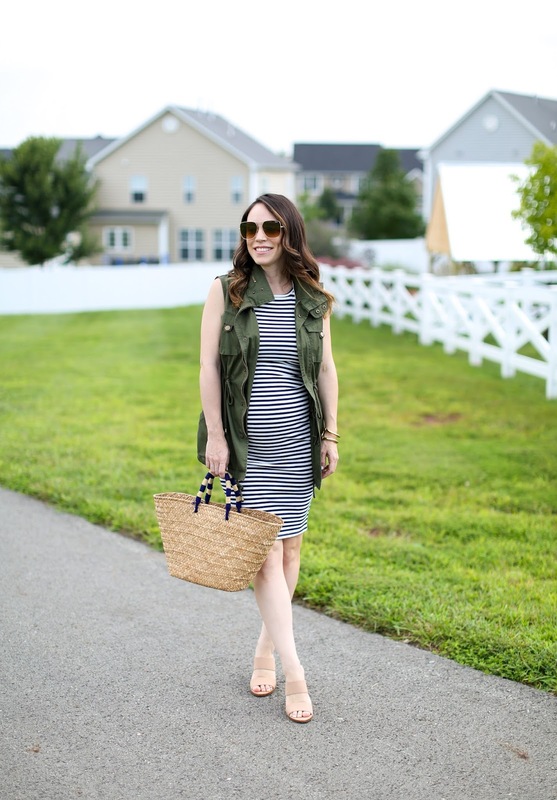 You may remember seeing this vest last fall in this post (and in this one a month ago) and I knew that I would get tons of use out of it for more than just that season. If you live somewhere that doesn't get too cold in the winter, than this is a year round piece for you. It looks great with sleeveless tops, short sleeves, long sleeves and sweaters - it's as versatile to me as this jacket (see it styled here, here and here) that I wear almost 10 months out of the year. And yes, my bump has come out of nowhere and is in full display now. Well, most of the time - if you catch me in the morning or early afternoon it is much less prominent, and certain outfits still hide it, but anything fitted really shows it off! A quick skincare PSA - Colleen Rothschild is having her Labor Day sale beginning today until September 4th! It's 20% off sitewide with code: LABORDAY. There's also a Discovery Set which is a great way to try many of her top-sellers before committing to full sizes. If you need recommendations, read my recent post reviewing some of her products. But if you get nothing else, this cleansing balm is a must-have!